Ships tomorrow if you order in the next 22 hours 33 minutes. Curcumin, a spice, has advantageous results on several factors known to play a role in cardiovascular disease. For example, it is said to improve the function of the endothelium. Motherwort is known to calm excess energy that courses through the heart. 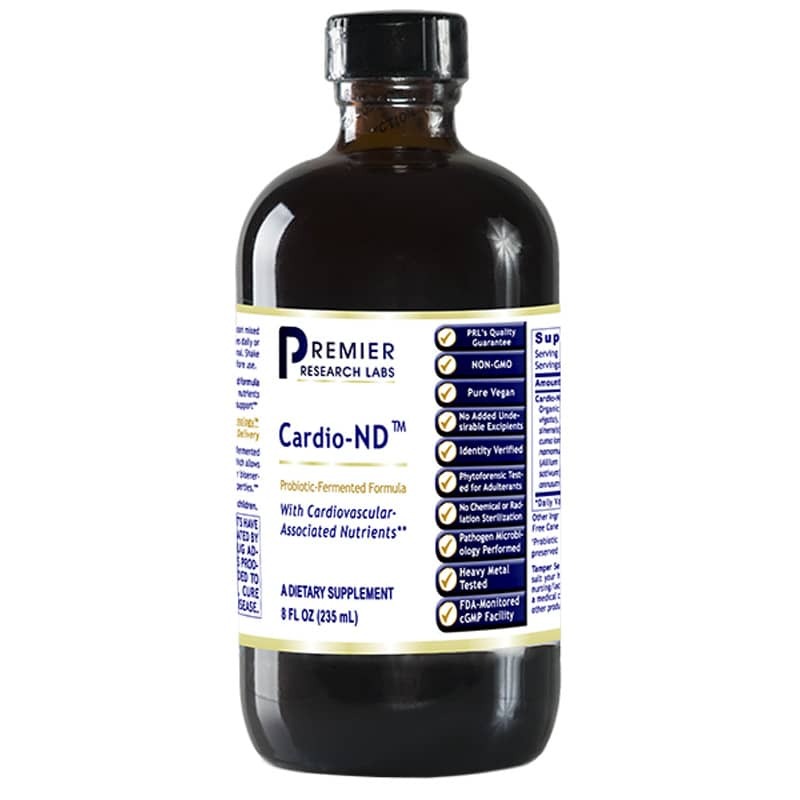 That's why these are two of the main ingredients in Cardio-ND by Premier Research Labs, a natural supplement for cardiovascular support made from a probiotic-derived formula. This product features ND Technology: nanized delivery. This means that the nutrients are pre-digested into extremely small particles, making them super bio-available. Premier Research Labs uses its own proprietary fermentation process using unique multi-strain, probiotic colonies. The benefit of this is rapid cellular delivery and 4-polarity dynamics. People report that they feel the effect of this product the very first time they take it. If you're looking for a natural supplement for premier cardiovascular support, this could be for you. Order online today! Organic Hawthorn (berry) (Crataegus laevigata), Green Tea Extract (leaf) (Camellia sinensis), Organic Turmeric (rhizome) (Curcuma longa), Indonesian Cinnamon (bark) (Cinnamomum burmannii), Wild Bear Garlic (leaf) (Allium ursinum), Garlic Extract (bulb) (Allium sativum), Organic Cayenne (fruit) (Capsicum annuum); fermented in probiotic culture. Other Ingredients: purified water, organic gluten-free cane alcohol, organic molasses. **Probiotic culture inactivated after fermentation; preserved with organic cane alcohol. Adults: Take 1/2 teaspoon mixed in 1/4 cup water or juice, 2 times daily or as directed by a health professional. Shake gently before use. Recently started taking based on doctor's recommendation. Have noted some changes already. My husband has been on this for several years and it has helped. Have only been taking Cardio-ND a month so too soon to tell if it helps . My husband was advised to take Cardio-ND by our Naturopath for heart and circulation support. We both believe it has made a difference. This company is outstanding to deal with and ships the quickest of any supplement company I have dealt with. They also do the best job of packing which is especially important since this bottle is breakable. I would recommend the product and company.